Every company has a story and our customers are curious about how Apples of Gold became a main contender in the online jewelry & wedding market. Since shopping with Apples of Gold and getting to know us isn�t quite as simple as walking into a jewelry store and chatting over the glass showcases, we strive to give that personal, relational feel by telling a little of our company�s story and background, as well as being available by either phone or email to answer any questions that you may have. Apples of Gold Jewelry launched its online presence in 1999 on the premise that traditional jewelers are overpriced. Markups can range anywhere from 200-300%. Seeing the jewelry prices in high-end retail fine jewelry stores as exorbitant, Apples of Gold dared to believe there was a better way, and on that premise, Apples of Gold was launched! We vowed not to compromise on quality, but by working directly with manufacturers and wholesalers across the United States, we were able to bring a value-based approach to our jewelry designs without ever compromising on quality or providing a "lesser than ideal" choice. In fact, as the years went on, we saw that many online jewelers compromised their quality in order to compete in a tough market, but we stayed the course at the cost of personal loss, rather than waiving the white flag and opting for something "cheaper". Our mission was intact: quality jewelry meets value and affordability. 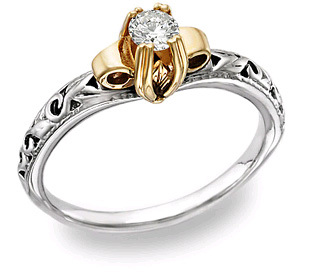 Apples of Gold Jewelry has now been operating online for over 18 years and currently have almost 10,000 jewelry items online from diamond engagement rings to gemstone rings, gold crosses and Christian jewelry, to wedding bands and more. Apples of Gold originally branched off of a family-owned Los Angeles jewelry wholesaler with over 30 years of experience in the jewelry industry. As such, we seek to work only with local wholesalers and get all of our jewelry from American suppliers. In fact, the vast majority of our jewelry is made right here in the U.S.A.! We sought the most experienced and value-based manufacturers in the jewelry trade at the heart of the downtown, L.A. jewelry district and then branched into manufacturers and wholesalers in New York and Ohio and niche jewelry manufacturers across the States, including Virginia, Rhode Island, and Louisiana, while keeping our roots grounded in California. In short, we are an American brand. Working with the same jewelry manufacturers and wholesalers that supply traditional jewelers across the United States, and by selling directly online to the consumer, Apples of Gold has been able to offer the same jewelry that brick-and-mortar stores carry, but for an average of 30%-40% below standard, traditional retail prices. With a focus on high quality jewelry, personal customer service, affordable pricing, and business ethics beyond reproach, Apples of Gold quickly established its name within the online jewelry retail market. And our name? Where does our name hail from? It's Biblical. We found that fitting to meet our ethical standards in business and the way that we strive to treat our customers and our employees. "A word fitly spoken is like apples of gold in pictures of silver" (Proverbs 25:1). As such, we are also a Christian-owned company who seeks to glorify God in all that we do!